When it comes to being on your A-game while on the slopes, a good snowboard makes all the difference. Quality design that provides an ergonomic balance and is tuned accordingly allows for completion of stunts and tricks while also providing the ability to advance one’s skills to a greater degree. When an individual’s snowboarding equipment doesn’t meet the challenge of the slope, not only will the enjoyment of the course and the board be diminished but also the opportunity to show off your talents. Finding a high-quality, low-cost board is the holy grail for snowboarders who often must balance price with quality. In this review, we will be examining the Morrow Fury Mens Snowboard Package: a low-price snowboard from a high-quality manufacturer. This Morrow snowboard features a directional design and offers thrills on the slope in the form of a versatile board. Marketed as a smooth-ride board, the Morrow snowboard offers a sleek ride for veterans and beginners alike. Transitioning between air and snow pack is a cinch; the board offers great vibration dampening and helps to reduce shock. In order to further determine how effective this board will be for you, we will go over the basic specifications as well as the pros and cons of this snowboard. The Morrow Fury Mens Snowboard Package has a great balanced feel, first and foremost. The ergonomic design translates to a sense of control while on the board that is rarely present in a snowboard at this price. The Morrow snowboard responds excellently which makes it a delight to butter on this beauty. The convertible toe straps help to eliminate any pressure points that traditional straps have by securing over the top of the boot with the soft, foam material. The soft flex ankle strap assists in support and allows the rider to respond with the board, no matter what level of experience the rider is at currently. Some negatives to the Morrow snowboard include damage resistance and popping power. While I had no trouble navigating the board and did not damage the unit while in use, some customers have reported that the stiff board is prone to cracking and breaking on the nose and tail, perhaps due to the stiffer tail flex that is standard with this board. Another issue was that due to the overall stability of the board, popping was more difficult; getting air with this board is not its strong point. For someone who is beginning to snowboard, such as a younger child or novice in general, this Morrow snowboard is a great buy. Due to its low price and stable design, it will be forgiving to those who are just beginning to learn the basics of snowboarding. Some of the cons listed, such as lack of popping, may be an advantage for someone who is considering this purchase for a child and wants to make sure that they are not tearing down the slopes and flying through the air without any experience. All in all, for less than $200, this board is a great buy for the snowboard initiate. 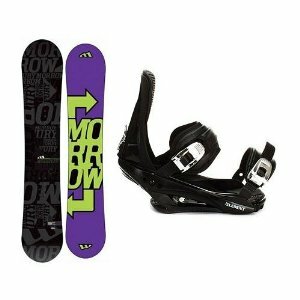 This entry was posted in Morrow, Reviews, Snowboarding, Snowboards and tagged Morrow, Morrow Snowboard, Snowboard. Bookmark the permalink.